We said it was coming, and now it is here! LiteSpeed Technologies is pleased to announce QUIC support! As of today, your LiteSpeed-powered sites can be on the cutting-edge with QUIC, via LiteSpeed WebADC and LiteSpeed Web Server. 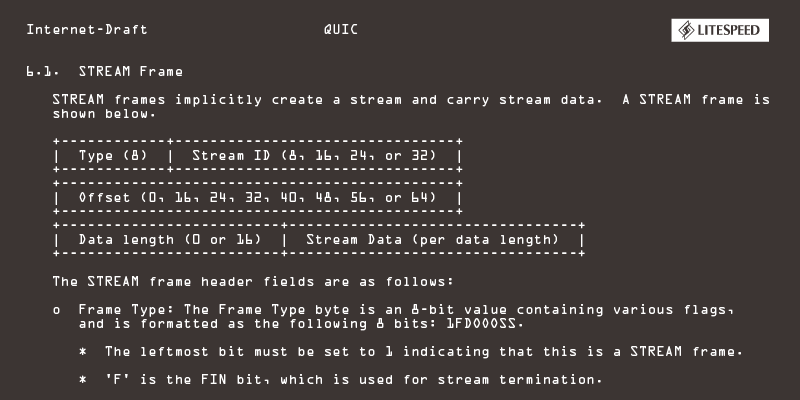 QUIC (or, Quick UDP Internet Connection) is an experimental protocol initially developed by Google in 2012, and announced publicly the following year. As of mid-2015, roughly half of all requests from Chrome to Google servers were served over QUIC, and Google intended to ramp up QUIC traffic, eventually making it the default transport from Google clients to Google servers. QUIC is now in the hands of the IETF, which is working to develop a standard. Why use a QUIC Server? QUIC is a good choice for those looking to reduce connection-establishment time and improve congestion control. QUIC takes a unique approach to classic latency problems. Rather than attempting to solve the issues of packet-loss and long RTT’s (Round Trip Times), QUIC developers have devised new time-saving and resource-saving ways around these issues. SPDY and HTTP/2 have made significant progress in improving application performance, but they fail to address the problem of high round trip time. There is a limited amount that can be done to improve RTT, as response time over a network is limited by the speed of light. QUIC sets aside the hard-to-solve question of reducing RTT and instead concentrates on reducing the number of trips that must be taken. When establishing a secure network connection with HTTPS, multiple round trips are required. The client and server shake hands and share encryption keys before they ever get around to the initial request. The QUIC approach is to combine some of these steps, which results in a need for fewer trips. QUIC uses UDP (User Datagram Protocol) instead of the ubiquitous TCP, and as such a multi-step handshake process can be stripped down to 1 or 2 steps, depending on whether this is a new connection, or a re-establishment of a known one. QUIC deals with packet loss more efficiently than HTTP/2. HTTP/2 and TCP rely on consecutive packets, which means the connection is stalled when one packet goes awry. QUIC and UDP, on the other hand, don’t require packets to arrive in order, and as such, one missing packet can’t tie up the entire queue. LiteSpeed provides the first production-grade mass-market QUIC implementation available for the public. If you want to serve your web content using the QUIC protocol, LiteSpeed is the solution. Concerned about user experience? Who isn’t? You gain an impressive edge over your competitors by serving applications over QUIC. Your visitors will love it. Shaving off even a few hundred milliseconds is important when it comes to UX. The site that loads in half a second now could load instantaneously over QUIC! QUIC is not a niche product. QUIC support has been enabled by default in all Chrome releases since August of 2013, and recently it was introduced in Opera as well (although it is disabled by default). While it has been widely adopted among Google’s own services, you’re not likely to find QUIC in use much outside of Google space. That is, until now. Yes, now you can have a QUIC-powered WordPress blog, Joomla site, Magento shop and more. If you can serve it from LiteSpeed, you can power it with QUIC! QUIC support is built-in to LiteSpeed WebADC 2.1 and LiteSpeed Web Server 5.2. We’re energized by this new protocol, and motivated to see what we can do with it, so please stay tuned. And don’t forget to tell us what you think! How to enable QUIC for LS Web Server 5.2? is there any tutorial or guide? Sure, we have a wiki: https://www.litespeedtech.com/support/wiki/doku.php/litespeed_wiki:config:enable_quic. Hope that helps! The claim, “LiteSpeed provides the first production-grade QUIC implementation available for the public.” is not quite accurate. The Caddy web server, which now has over 1 million downloads and is being used in production by tens of thousands of sites, has been offering QUIC for over a year now to the public. The QUIC support is powered by https://github.com/lucas-clemente/quic-go, an excellent Go implementation of the QUIC protocol. Thank you for your comment. That was poor word-choice on our part. We’ve updated it to read “production-level mass-market QUIC implementation.” We acknowledge Caddy is the first non-Google QUIC server, but it serves a niche market. LiteSpeed has broader availability among site owners with varying levels of technical skill, offering anyone the ability to power their WordPress, Joomla, Drupal, etc. sites with QUIC. Those CMS make up the vast majority of the web.